Offer your guests a wonderful memento! 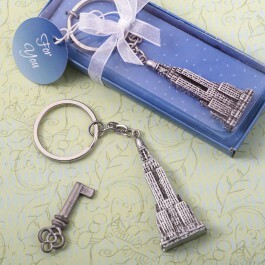 The Empire State Building is an iconic landmark and they will be delighted to attach this charm to their keychain. Our Empire State Building charm is made of polyresin and hand painted in an antique silver finish. The charm is attached to a silver metal chain and silver key ring. The keychain is beautifully presented in a clear gift box with a blue stage. The box is wrapped with a white organza ribbon and bow. Attached to the bow is a blue 'For You' tag. Size 4.125" x 0.75" x 0.375" Made of sturdy poly resin Hand painted in an antique silver finish Charm attached to a silver metal keychain and silver keyring An iconic landmark that makes a great favor for any classy event!